Lack of access to menstrual products and widespread stigma surrounding periods keep millions of girls from going to school around the world. The United Nations’ Global Goals call for universal access to menstrual hygiene management, universal education, and an end to gender inequality. You can join us in taking action on these issues here. In 2014, former South African President Jacob Zuma established the position of minister of women in the presidency, a post meant to work toward gender equality in all areas of society. One of the chief goals of the position was to make sanitary pads accessible to all girls and women, a longstanding source of inequality and stigma. One problem dogged the effort, though: No protocols were set up to implement it. Now, four years later, a Johannesburg-based community activist named Zola Ndwandwe is trying to make this goal a reality by pressuring the government to follow through on its commitments, mobilizing grassroots campaigns to empower women, and enlisting the help of other organizations dedicated to gender equality. 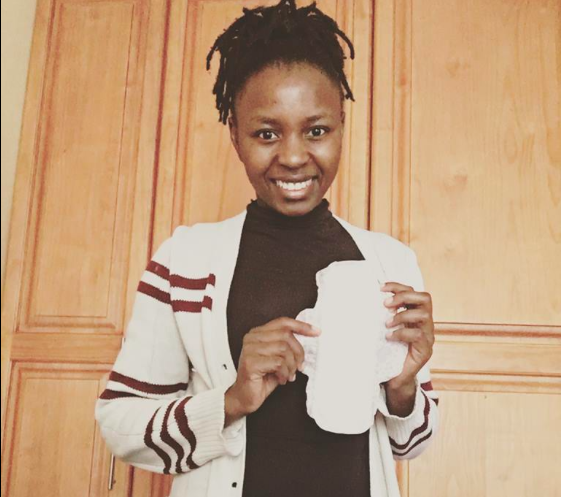 Her grassroots organization Team Free Sanitary Pad is campaigning to make sanitary pads available to all women in all contexts throughout South Africa. “One of our major objectives is to make sure sanitary pads are as accessible as condoms,” she said. Like many women in South Africa, Ndwandwe was spurred to action after facing menstrual health stigmas in her own life. She saw that these stigmas influenced men to regard periods as disqualifying factors for women pursuing jobs or degrees. She then realized that every woman in the country probably had a similar story, and this pervasive discrimination squandered women’s potential and essentially constituted a human rights violation. “I imagined thousands of women in my situation, not just at work, but also in public spaces, and thought it was time to deconstruct the narrative and end the stigma,” she said. The scale of women and girls who are affected by the absence of menstrual health care is significant. Throughout sub-Saharan Africa, more than 1 in 10 girls miss up to 20% of the school year because of their periods. In South Africa, that means more than 200,000 girls are missing large swaths of school time. These girls often don’t have access to sanitary pads, and resort to using materials like rags, newspapers, or bark to manage their periods. Other times, they’re deterred from going to school because of stigmas that prevent menstruating girls from touching water or cooking, going to religious ceremonies, participating in community events, and more, according to the United Nations Population Fund. These stigmas follow women throughout their careers and can lead to being fired, demeaned at work, or passed over for promotions, according to Ndwandwe. She wants to end the stigma by making menstrual health unavoidable. She's working to get buses and billboards to showcase menstrual health issues, schools to hold classes on them, churches to incorporate them into their services. this is also aligned with #TeamFreeSanitaryPads - stay tuned for more info. And she’s enlisting the help of men. “I feel like men treat [menstrual health] as something that shouldn’t be thought about, something that should only be a female issue and it shouldn’t worry them that women are missing out on school because of a lack of access,” she said. “We want that to end, the stigma and the shame. We want men to be aware and stop discriminating on the basis of women having periods,” she said. Ndwandwe also wants to promote standards throughout the industry and throughout government services that oversee menstrual health care. Right now, many sanitary pads companies aren’t vetted by the government and would fail safety checks. Similarly, waste management systems often can’t handle sanitary pads and their improper disposal can lead to water contamination. Both of these issues can lead to health problems, which can lead to long-term consequences. In recent months, Global Citizen has been working with groups like Team Free Sanitary Pad to call on the South African government to make sanitary pads accessible to all girls and women. In October, the government announced that it would be removing the “luxury tax” that was placed on tampons and other sanitary pads. Now Global Citizen is still calling on the government to commit $58 million per year, over the next two years, to jumpstart a program to ensure free sanitary pads and products for all girls in no-fee government schools. In addition, we’re calling for menstrual health education to be incorporated in schools throughout the country for boys and girls. Ndwandwe hopes that as these reforms take place, the stigmas surrounding menstrual health will finally lift. "I work on it because it's my passion, there's absolutely no payment, it comes from the heart. I want to make the world better.🙏🏾"
“As more awareness and progress is made, once everyone comes to a holistic understanding of menstrual health and hygiene issues, it could just open up opportunities for women in government and corporate spaces,” she said. “Women should not be ashamed of being women, and take charge and bring about confidence in themselves and gender parity.